The Empire or the Rebellion? Both! These bookends feature half of the Imperial and Rebel logos. Made of high-quality polystone and felt lined. Perfect for holding comics, graphic novels, books, DVDs, video games, or Death Star plans! The Empire or the Rebellion? With this offering from Gentle Giant LTD's bookends series, you don't have to choose! Just as the galaxy is divided in half, your bookshelf can be as well with this pair of bookends featuring half of the Imperial and Rebel logos. The Imperial side will keep your unruly books upright and in line, while the Rebellion side gently supports the cause of your shelf. Together, these two iconic symbols of the Star Wars universe will add to your home decor. 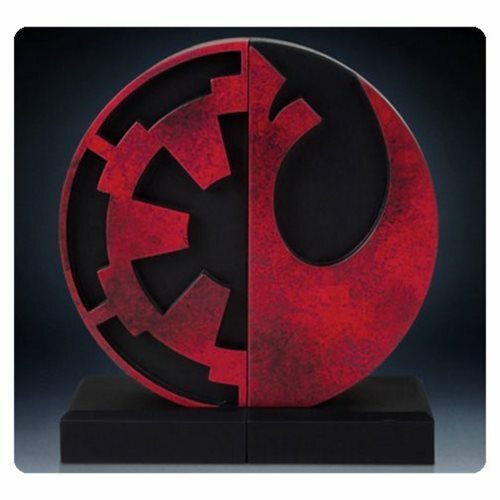 The Star Wars Imperial and Rebel Bookend Logo Statue is manufactured of high-quality polystone and felt lined to grip and keep your books in pristine condition. These bookends are perfect for holding comics, graphic novels, books, DVDs, Death Star plans, and video games. Or display them together as a symbol of the galactic struggle! Each measures 14-inches tall x 7-inches deep x 5 1/4-inches wide. Ages 18 and up.